That’s what our camel driver said when someone asked him why he’s so happy. His name was Said (Sigh-eed), a word meaning “happy” in Arabic. Most of us thought he was crazy, even drunk; shrieking, cackling and snorting while he laughed seemed to be his favorite forms of expression. Maybe he was crazy. But for someone to say something so profound as to change the way I reflect on life because it’s so true and so real, then there has to be some grain of sanity in his wild noggin. I’ve been thinking about what he said ever since. The drive to the desert took nearly 10 hours. We left Fes at 7 a.m. and hit to road, driving south towards the Moroccan-Algerian border. We saw different types of Moroccan terrain as we drove through the various regions; first was the green region, called the Switzerland of Morocco. Palm trees and other green leafy plants stretched for miles in-between big, cascading mountains. The tree population started to fiddle out as we made our way higher up the Atlas Mountains. We drove on some long, winding roads carved out of the sides of the mountains, and l’ll admit it was a little terrifying. But the views were breathtaking. Looking out of the window of the van, it seemed as though we could see all of Morocco beneath us. We continued climbing until we reached the peak of the mountain range and then began our descent. Downwards we saw the mountains take on a different form. Our surroundings began to resemble the Grand Canyon, with stretches of roads between the canyons that reminded me of Arizona. We stopped a few times along the way to take pictures, and I’m so happy we did. Looking at views like those make me realize the world to me gets more and more beautiful every day. Our driver pulled on the road and headed into Nowhereland. Flat sand a stretched in front of us as far as our eyes could see. Though packed down, the sand we drove on was bumpy enough for us the be shaking and shifting in our seats for the ride, which seemed like it would take eons. And then we saw them. Little hills in the distance. As we drove towards them, be they grew into bigger hills until finally we could see the distinct outline and height of the sand dunes. We were in the Sahara Desert. 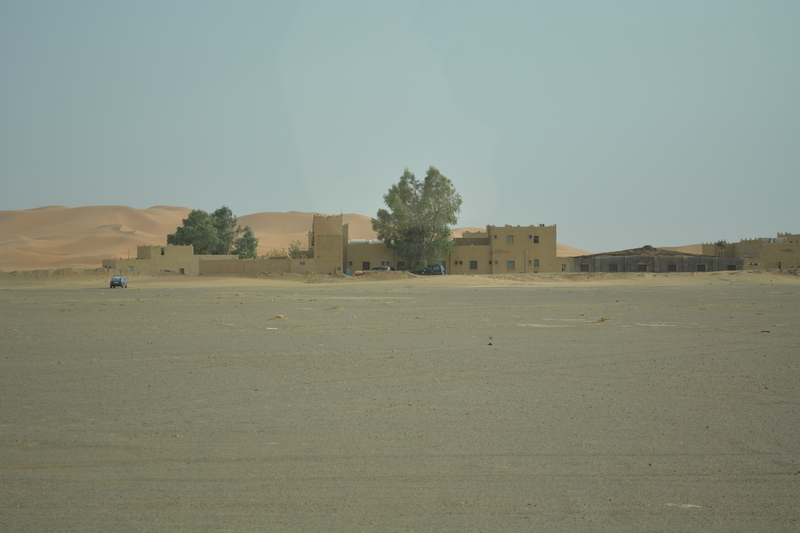 We pulled up to the hotel, which was little more than a motel with sand walls and no electricity. We dropped off our big luggage in a storage room and packed small bags to take with us overnight. We had arrived late, so we needed to hurry to see the sunset on camelback. Once ready, our tour guide rushed us to the posterior of the hotel where we saw two lines of camels and a camel driver and his apprentice waiting for us. From the first moment Said introduced himself and threw his head back to cackle, we knew he was crazy. He had wild eyes and a goofy grin that permanently plastered on his face. One by one, we mounted the camels’ backs then held on for dear life as the camels lifted their hind legs first, then their front ones, throwing us back and forth on their bodies. My camel’s back was at least eight to 10 feet tall and was the second from the front in the line. When I asked Said what my camel’s name was, he laughed and said, “Just call him, uh, Jimmy Hendrix,” and then he shrieked with laughter some more. Fine, Jimmy it was. 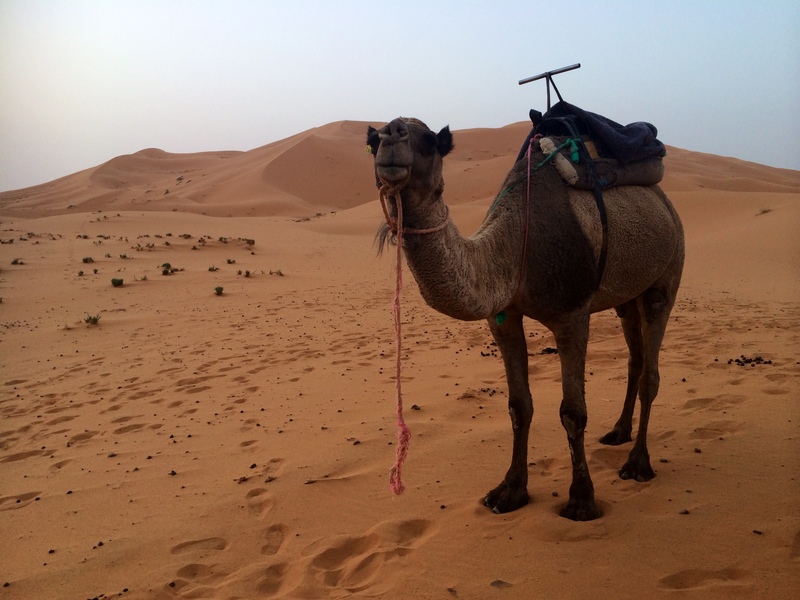 Jimmy and I became hit it off as we started our trek through the dunes. Leading the rest of the pack save for the one camel in front, we bounced up and down walking up the mounds of sand. Said walked at the very front, leading the camels in the best spots so they wouldn’t have to carry us up any hills that were too steep. We were on our way to the desert camp. Our caravan stopped at a peak to take pictures of the sunset. The sun was small, poking out just above the hilly outlines. Surreal doesn’t begin to describe how that moment felt. 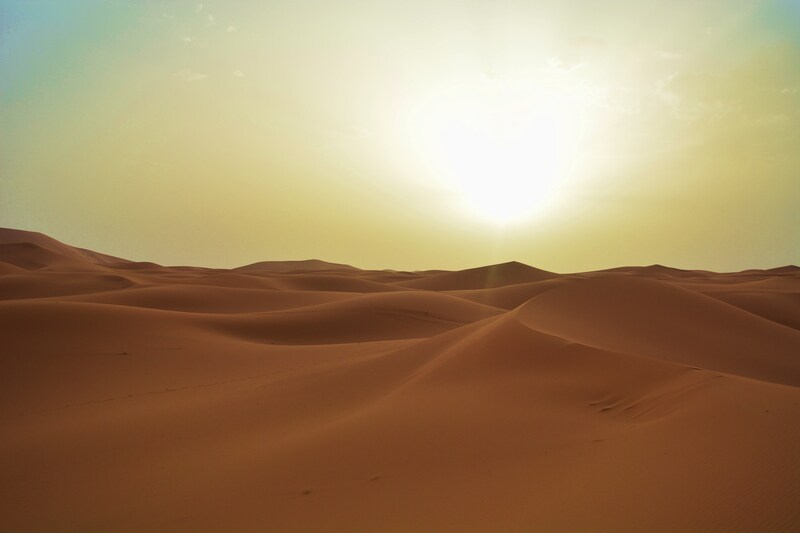 We were watching the sun setting behind the dunes of the Sahara Desert. Meanwhile, my friends were at home trudging through the first week of senior year. Just surreal. Our ride lasted a little more than an hour. 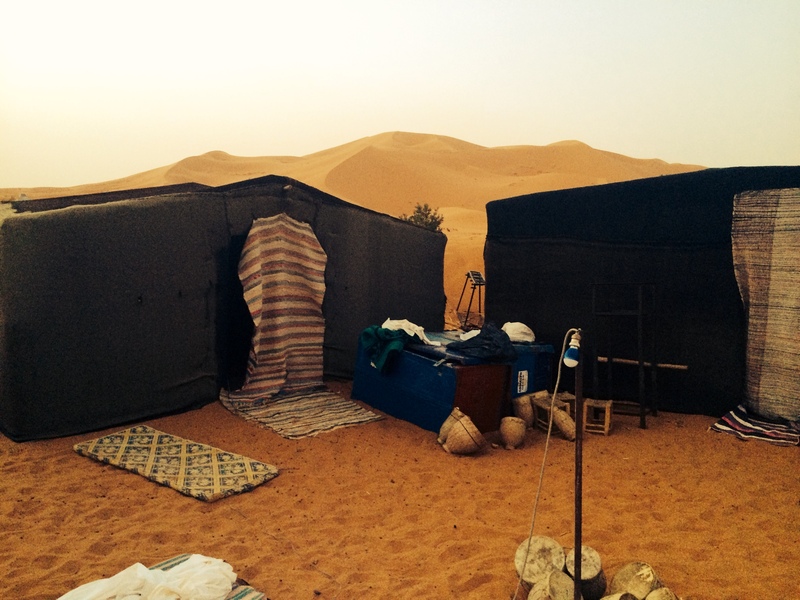 We approached our desert camp and saw a bunch of tattered tents arranged in a circle. In the middle lay several blankets, creating a big mat. On the mat were few small tables wrapped tightly with waterproof table clothes. 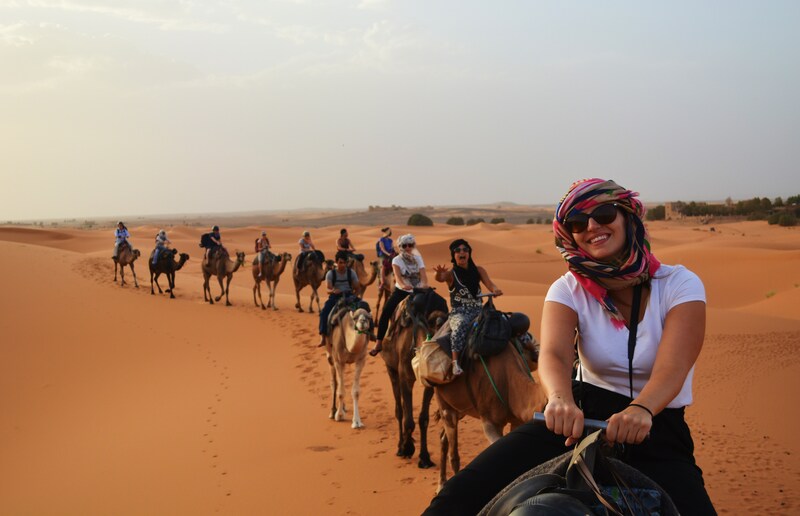 We rode up to the camp and one-by-one dismounted the camels. Most of us had already decided we’d be sleeping outside that night, so we just threw our bags in random tents but met out in the center of the camp. As we sat, talked and gazed at the wondrous view, Said went to work with his apprentice to prepare dinner for us. There was a small tent that served as a kitchen, where he stored and cooked the food. He told us dinner would take about an hour, so we had some time to kill. Three others and I decided to go for a walk. Our camp was at the bottom of one of the largest dunes in the area and we reckoned we could get an amazing view from the top. We were not disappointed. The sand was very difficult to walk in; each step sank us lower and lower into the light brown terrain. Our guide had instructed us to keep our shoes on as protection against scorpions and other creatures that may be dwelling in the sand, making the hike up even more strenuous. The others walked far in front of me and I was struggling to keep up. I hadn’t been in the best shape lately, and the lack of fresh veggies and healthy meats on the trip hadn’t helped. My breaths were getting heavier and faster. I was thinking about just stopping where I was and looking out over a smaller dune. It would be easier and more comfortable. But I couldn’t. I had to keep going. I had to reach the top. 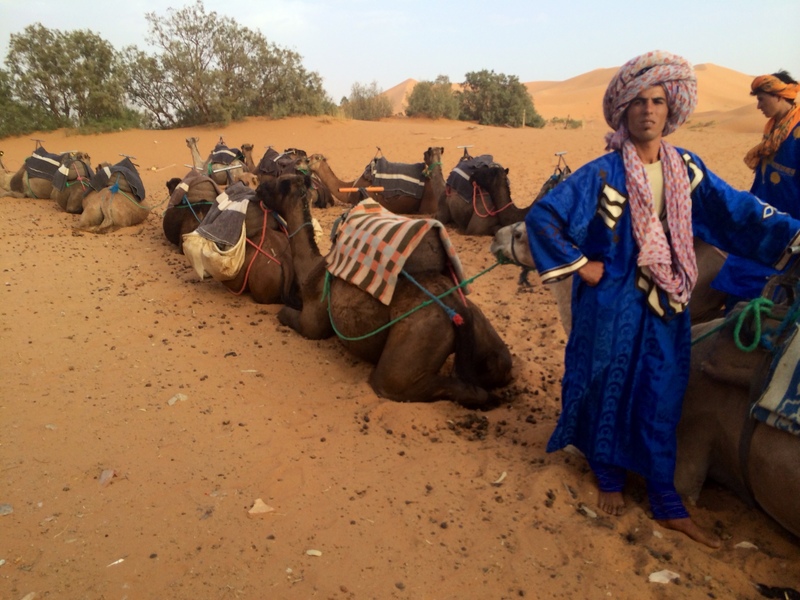 It was the first and maybe only time I’d be in the Sahara, and I needed to do it the right way. So the others waited as I powered through to catch up to them. Only a few meters separated up from the peak. The thought of the view kept me going. Slowly, we reached the top and finally sat down. Rows of intertwining dunes stretched out as far as we could see. The sky, now a deep blue color, sat like a blanket over the sand, sprinkling the view with stars. If I thought the sunset was unreal, this view was simply transcendent. I had to pinch myself to make sure I was actually sitting on top of that edge. I didn’t bring my camera — and I’m glad I didn’t. Otherwise I would have been too busy looking through a lens to drink in the moment. The four of us sat there for a while an talked about the view. Gradually our conversation evolved into stories about life. Our group was me, a 20-year-old student from Washington, D.C., a 24-year-old Australian doctor, a 30-year-old Filipino Canadian nurse and a 45-year-old midwife from Toronto. We all came from different backgrounds and experiences, but connected in that moment under the stars. We talked about our broken pasts, shaky lives and uncertain futures. 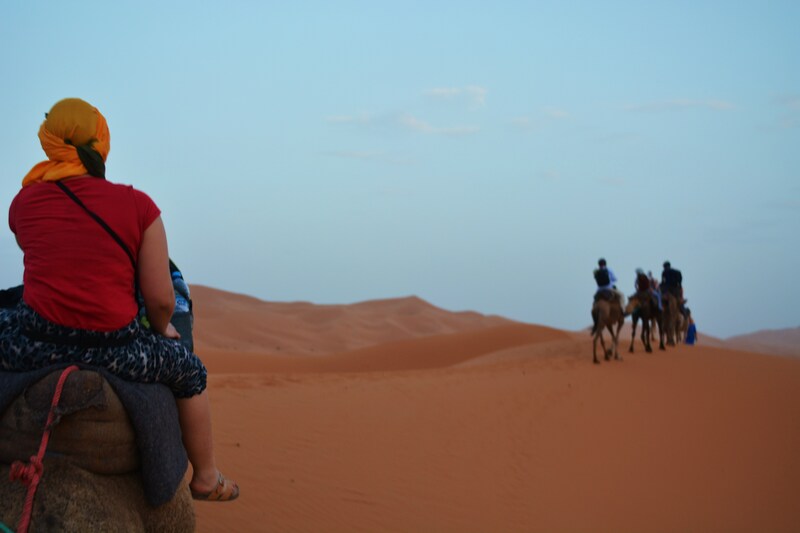 Looking out over the vast Sahara Desert, we felt small, humbled. We were all humans, all doing what we can to get by in life. And that was enough. It was almost dinner time so we started our decent down the hill. The smell of good food met us when we approached our camp. Said made beef tajine, a dish with meat, potatoes and carrots cooked in a tajine pot. We happily ate at the small tables, filling up on the meal. After dinner, Said and his apprentice treated us to some Moroccan music. Both men played drums and Said sang in Arabic. Being musical myself and seeing that there was a spare drum set, I asked if I could try playing along. A minute later, I there I was, beating on a drum with two Arab men in a desert camp. I didn’t know the songs, of course, but I made up my own rhythm to complement theirs. We played for everyone for about 30 minutes and our guide rallied everyone to get up and dance. 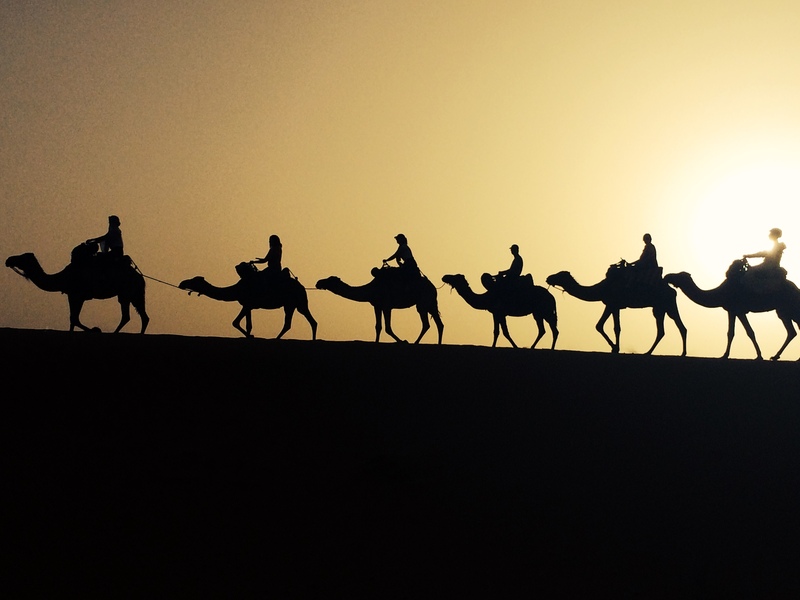 Soon though, we all felt fatigued from the day’s adventure (clinging to a camel for an hour is hard work!) and decided it was time to settle down for the night. And then I felt a drop. Then another. I looked around to see in anyone else had felt anything. Sure enough, people were touching their skin and looking up at the sky. It was raining! Even Said showed suprise, informing us that it only rains about five times a year in the desert. How cool is that? It was a light rain, not bothersome, but enough to make us retreat into out tents. We clambered into our tents, but then we heard a shout. Everyone ran to the tent where noise came from and saw two girls in a tizzy. One had gone to lay down and found a scorpion under her pillow. Said rushed into the tent, laughing, and captured the scorpion in a bottle — but not before he found another scorpion scurrying around his feet. There were two! He trapped both and got rid of them. The scene caused a fuss among the campers and many felt unsettled after that. The rain had stopped, so we decided to move our bags out of the tents have a slumber party in the middle, thinking we’d be safer from desert creatures that way. It took a while to settle back down with the thoughts of scorpion stings infiltrating our minds. It was nearly midnight then, but a few of us still couldn’t sleep. So instead we laid back and looked up at the stars. 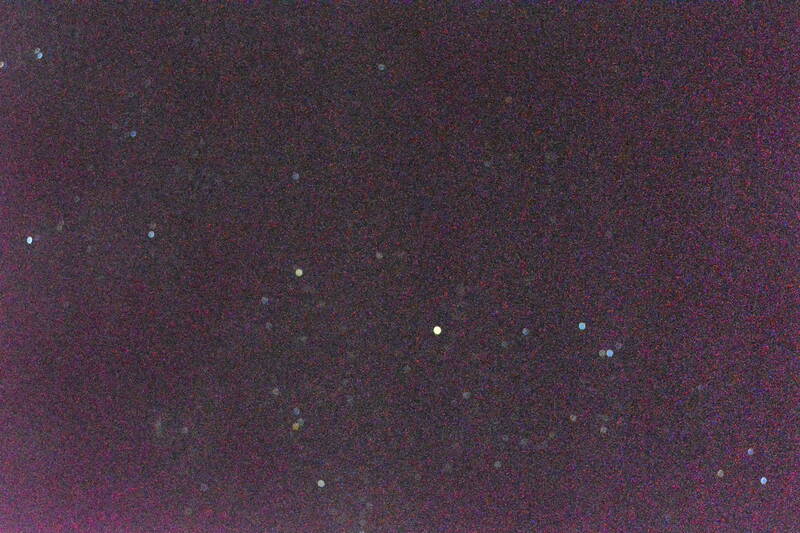 It was cloudy, hence the rain, but every once in a while, the clouds would part and we’d see the stars shine down to us. It was like every star in the galaxy wanted to be seen. Looking at the stars was like looking out over the dunes. It made me think again about how small I was in the scheme of the world. My problems, my insecurities, are nothing compared to the big picture. All that matters is living the best life I can. I thought again about what Said had said, making the most of the present because you don’t know what could change tomorrow. That night I fell asleep with a smile on my face, not thinking, not caring, about what the next day would bring. Alex, I read every single word with anticipation of what will come. You are an excellent writer. I know I’m your grandmother, but I know! Loved the photos, cringed when you mentioned scorpions and remembered when I took a camel ride in a Delaware park so my friend Dianne could take my picture.. I will never forget being thrown forward, then backward as the camel got up. So very happy that you won this trip. What a great experience. 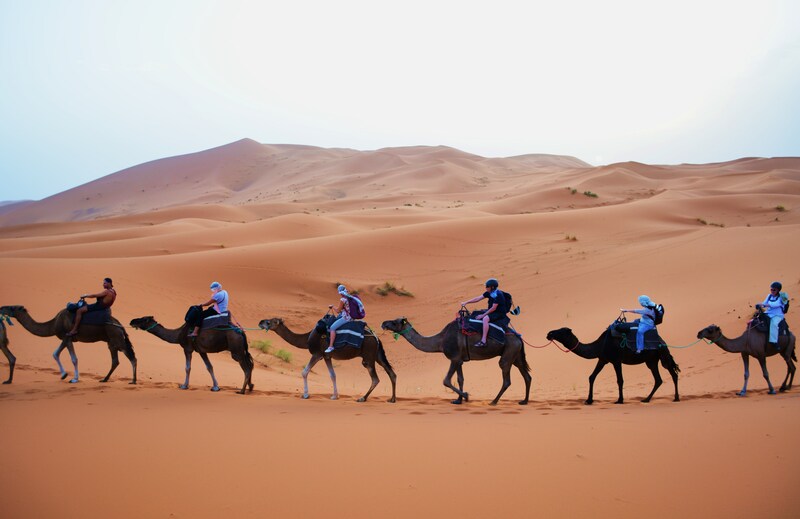 You have captured the great experience of the great Moroccan desert experience. This is definitely in the top ten on my travel wishlist – though I’m not sure how secure I would have felt starting out with that guide. 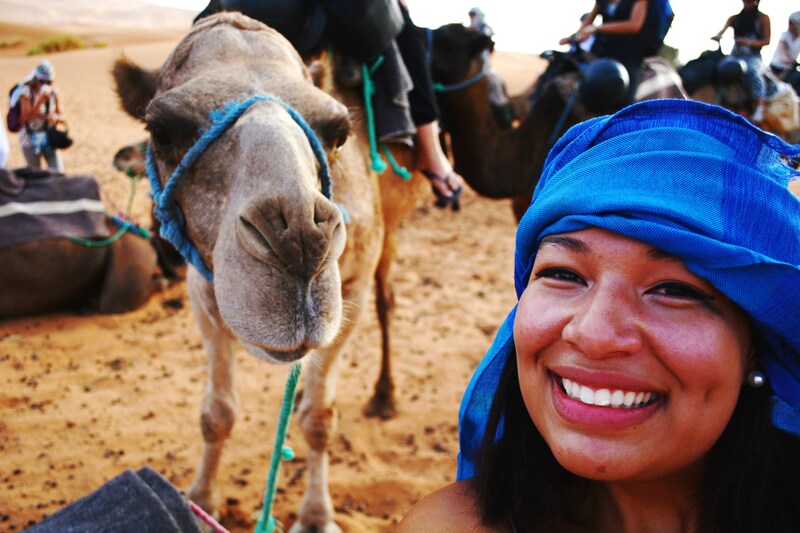 I love that your camel was named Jimi Hendrix!